Today, MSG hosts over 300 sporting events each year and is home to three pro teams: the Knicks, the NY Rangers (hockey) and the NY Liberty (women’s NBA). For basketball, the seating capacity is 20,000. Entering the coliseum, I was expecting a derelict facility (given that it’s 46 years old) but was surprised to see a spanking world-class arena. Newly-renovated last year, MSG was comfortable; the seats were cushioned; on top of the basketball court was a gigantic HD screen that endlessly projected slow-motion replays, up-close shots of the players and other highlights. When we arrived at 7:45 p.m., the players were warming-up. As the Mavs and Knicks stars were introduced, the last man to be called was the most “sikat:” Carmelo Anthony. He wore an orange bandana that was the same orange color that spread across the Knicks uniforms. Finally, the announcer says, “Let’s… play ball!” All the lights were off. The girls danced an intro number. After the players stood ready, Margot Bingham was called to sing the national anthem. Like we see on TV, once the song reaches those last few lines, everybody sings along. Someone screamed, “Let’s go New York!” It’s wonderful to see Americans so proud of their song, people, nation. Game on! New York had possession after the jump ball. But, like an ominous sign of the bad things to come, they didn’t even fire a shot: they were penalized after a 24-second shot violation. Bad sign! Seconds later, Tyson Chandler was lobbed an alley-hoop pass which he barreled into the ring. A slam dunk for the Mav’s first two points. Shot after shot, the Mavs wouldn’t miss. They converted on their first six attempts. No miss. After four minutes, the score was lopsided: 19-7. Chandler had one more dunk. And another. Three dunks in five minutes. Dallas is an amazing offensive team. They lead the NBA in points, averaging 113 per game. It was evident that night: after six minutes, they amassed 27 points. Moments later, the score was 29-11. Led by Dirk Nowitzi, the Mavs led from the first minute until the last. From beyond the arc, they buried 15 of 33 three-point attempts. This wasn’t a ballgame, it was a New York massacre. You know Americans; they’ll let you know in your face how they feel. They’re blunt and direct. And the New Yorkers let their players know how they felt. They booed. They turned quiet. The initial atmosphere of excitement was replaced by oh-no-here-it-comes-again…. another beating. By the end of the first quarter, the score was 36-24. At that point, the Mavs made 79 percent of their field goal attempts. Amazing statistic. As bad as the Knicks were, the Mavs were unstoppable — they were possessed when they possessed that ball. The Knicks weren’t a team of five players on-court; they’re a one-player squad. Carmelo Anthony led with 26 points but that was it; everybody else was lousy. This is nowhere near the team that won the NBA crown back in 1973 (their last win) that had Bill Bradley, Walt Frazier, Jerry Lucas and Phil Jackson, now the Knicks president. But as lousy as the Knicks were, the entertainment was fantastic. Plenty of celebrities watched. Golfer Jason Dufner. Actor John leguizamo. Devon Kennard of the Giants. Even John Starks came to watch. During timeouts, they have what’s called a “Dance Cam” where they find spectators who’ll dance and they’ll showcase their moves on the large screen. One man juggled balls. They also had these “machine guns” where they’d fire t-shirts to the crowd. One shirt was fired towards us and Jana caught it. They had a Tic Tac Toe game played by two men. They had all these side entertainment gigs to make the lousy game fun. 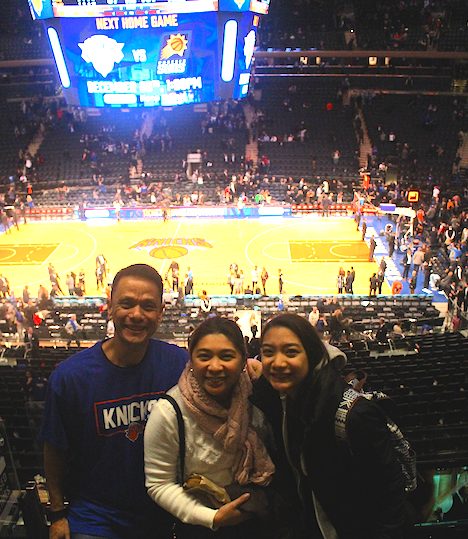 In all, it was fun despite the Knicks losing by 20.